The bag looks really pretty and housed inside it are 5 products. The quality of the pouch is nice and I have already had a golden themed pouch with the same make. This time, they have this silver one that looks good and reflects a lot of light, grabbing attention. 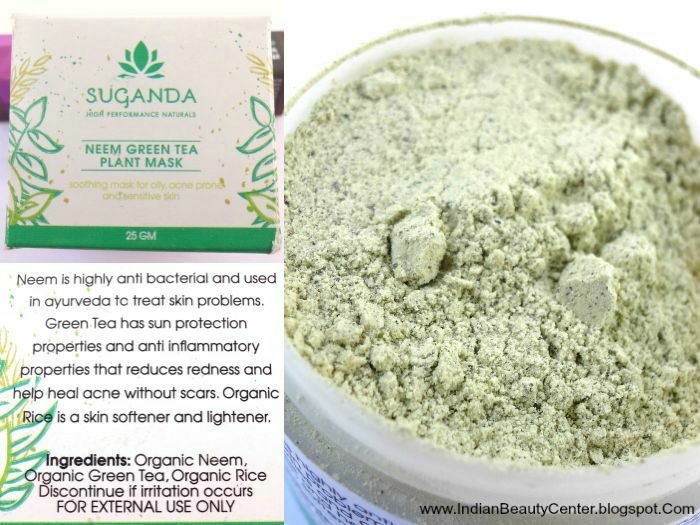 The first product that I got was the Suganda Neem green tea Plant Mask. 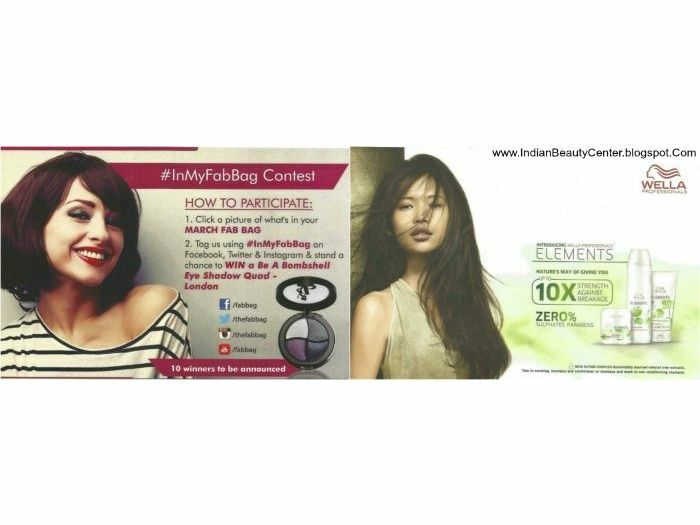 It contains Organic neem, organic rice and organic green tea and it is a powder face pack. The quantity provided is nice, provided it is a sample pack. I wish they packed it more conveniently because every time I open the tub, some product spills out. Anyhow, this looks really promising and claims to be good for my acne prone, sensitive, oily skin. Will see how this works out. I received a 25g sample of this one, price - something around Rs.375. 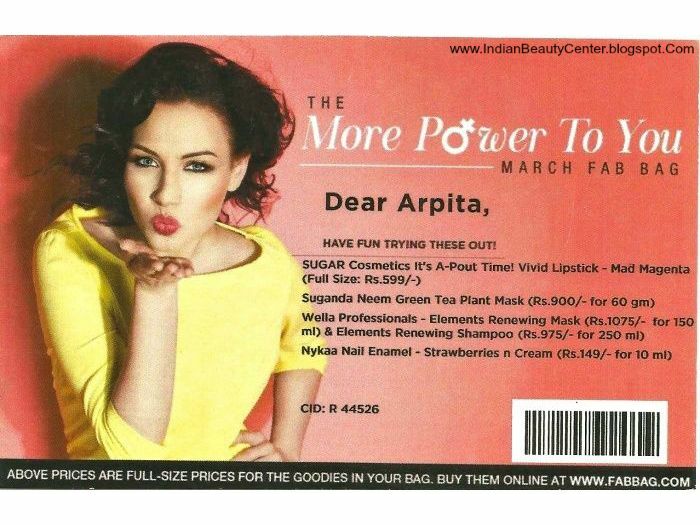 Next, I received Nykaa Nail Enamel, which is a beautiful coral-cream color. It is a nail polish and the brush of this nail paint is good. 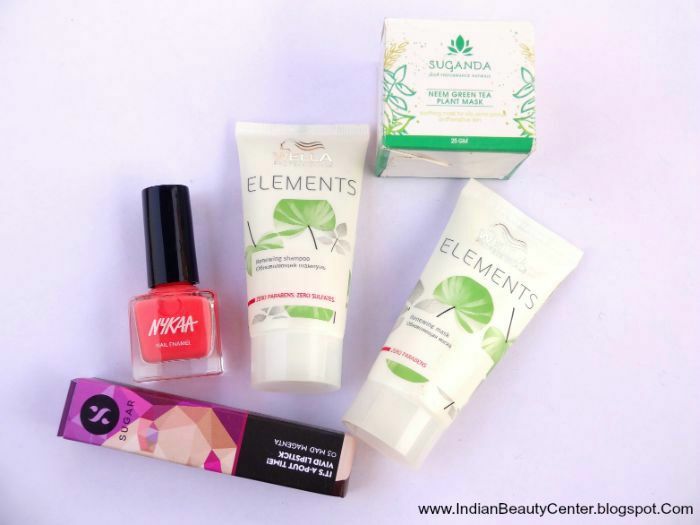 Nykaa is an online shopping website and now they have their delightful nail paint. I have applied this nail paint and it looks gorgeous on my nails. I got it in the shade Strawberries and Cream. I received a 5ml sample of it, priced at something around Rs. 75. I also received Wella Professionals- Elements Renewing Mask and Elements Renewing Shampoo. I have used both of these and I must say that the combo does work for my hair and their products are salon quality. It controlled frizz to an extent and my hair feels really soft and shiny. It also appears to be thicker. I will use these again and then make up my mind about purchasing the full-sized products. Both of these are sulfates and parabens free but I found silicones in the ingredients list. I received both sample sized (30ml) priced at Rs. 175 and Rs. 200 for the shampoo and the hair mask. 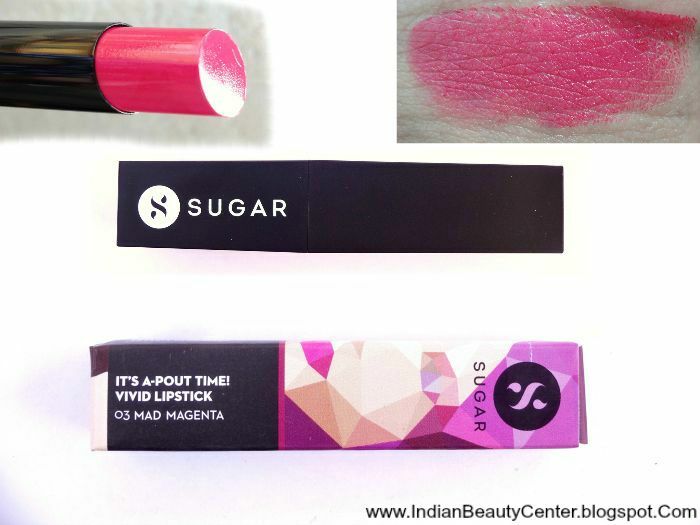 Final verdict : The main attraction of this month's fab bag is the star product- The SUGAR lipstick. 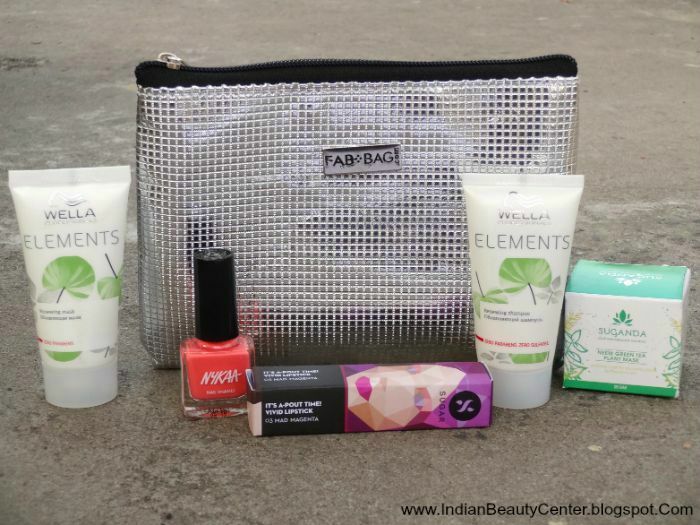 The Nykaa nail paint, the Wella shampoo, the hair mask and the Suganda face mask also sound good and are new products. 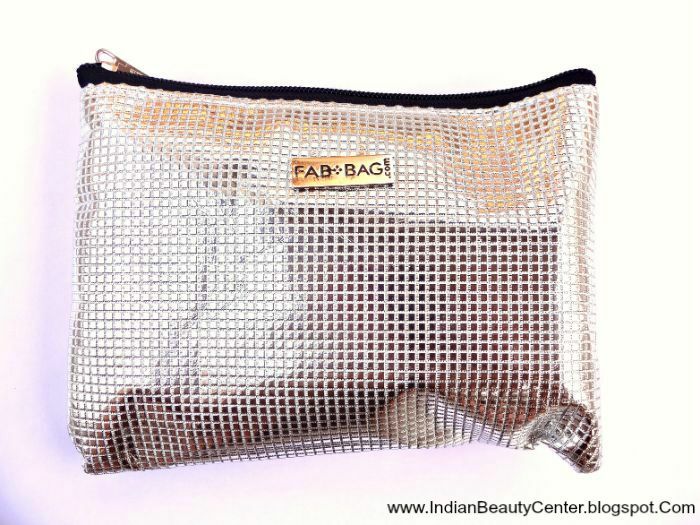 I am liking the fact that fab bag is not repeating it's products like last year. Fab post has been replaced this time with a few cards. This month's bag could have been better but nevertheless, it's good. 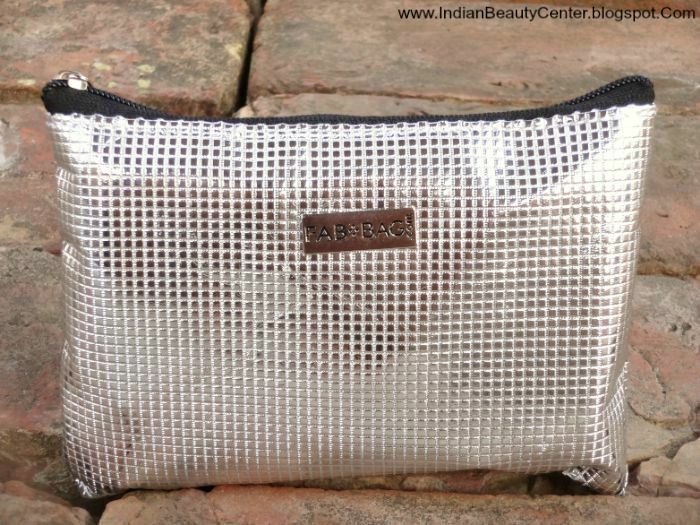 You must get this bag for that Sugar lipstick! Lovely products this time. My favorite is Sugar lipstick. Fab bag is giving it's best from past one month. Nice products!